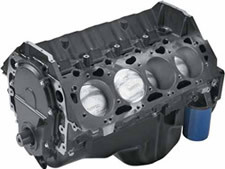 For those who want the sturdy foundation of the 454 HO as the starting point of a custom Chevy crate engine, this brand-new 454 partial engine from GM Performance Parts includes the forged crank, rods and pistons, as well as the balancer, oil pan and front cover. This partial engine does not included a camshaft, lifters, timing chain or cam sprocket. Use externally balanced flywheel for manual transmission applications. NOTE: Intended for pre-1977 street vehicles and all off-road vehicles. Not intended for marine use. NOTE: Distributor with melonized steel gear MUST be used with long blocks and partial engines with steel camshafts, or engine damage will occur. GMPP HEI distributor P/N 93440806 is recommended. Requires addition of heads, intake, camshaft, timing gears, carburetor, starter, fuel pump, distributor and ignition system and other misc. items (not included). Clutch linkage boss is cast into block, but must be drilled and tapped. Use externally balanced flywheel for manual transmission applications.